Ah yes, that hearty delicious healthful tuber. Bright in color and taste, bold in flavor, staple food of the tropics. You'ld think I'd get sick of them after peeling cooking and mashing 16lb. per week for more then a year (for Watercourse Bakery's famous Sweet Potato Cinnamon Roll, it's got veggies in it, it's good for you...). But no, these wonders of the plant world continue to enchant. HIP TIP #1: Poke the potato with a fork several times before microwaving. Seriously. After about 1.5 minutes I heard a great big BAM! 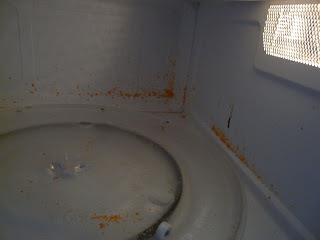 and I peered into the micro to a split open potato making circles on the edge of the plate, and a sniper like splatter. 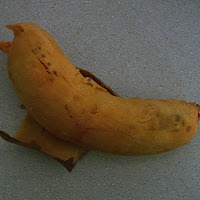 HIP TIP #2 : After poking the potato and replacing it till fully cooked, you can peel the skin off just like a banana. then you can walk around munching a large orange blob and get funny looks from your housemates. I decided to try a top down hat. I usually crochet hats as it's really easy to make round things crochet, but I wanted the yarn to stripe in that way that only knit can do. I casted on three stitches each to three double points and got started. 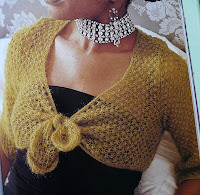 I began adding cables almost right away, making the cables steadily bigger as I moved down off the point. All of this (above) is one days knitting when you're a full time student. Makes you want to pursue an education eh? One more day's knitting at school finished it off. 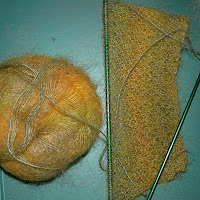 The nice thing about at top down hat is you can really get a good idea of exactly how big it will be. No guessing when to start decreasing by estimating the distance to the top. The earflaps were just knit down off the bottom edge. It's important I think, to give this kind of hat a nice even edge by casting off the entire edge in one fell swoop. I wouldn't cast off then add the ear flaps, they'll look pieced together. My other knitting goodie from Japan was a set of Safety-pin-style stitch holders bought for 100en (about a dollar, at their version of the dollar store). These made the process easier. 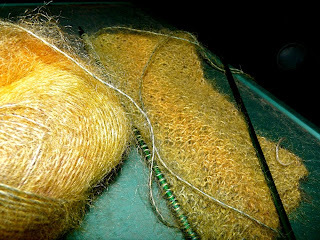 As for my next project, I think I'll flip through the Knitting Book I got for Valentine's and see what to do with a ball of yellow and green mohair. But Pinku has Flowers. Lots of them, pretty ones too. He couldn't remember if I liked Roses, hence the single one, didn't wanna get in trouble for not bringing one just in case! And it's First Friday! 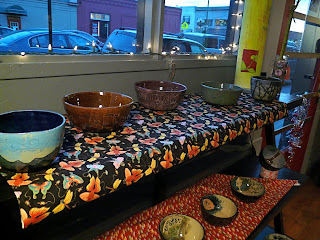 I was contacted through Etsy by a local gallery who had just realized the "shop local" gallery filling potential, and long story short I set up last night! 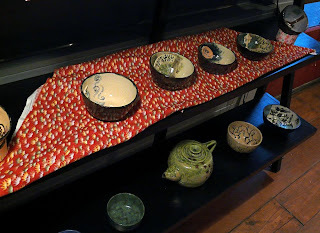 It's at Gallery Mio 821 8th ave. in the Santa Fe Gallery District. Any of you mile high denizins should roll on down and join the crowds tonight! I get a fair bit of feedback from customers, lookers, and most importantly friends and family who have gotten my bags as gifts. My parents keep asking for a bag with a flat bottom for keeping lunch containers upright and stacking groceries. I'd been considering the problem, and then I received the solution, two pairs of pants which are much wider and shorter then average. That is, after the legs are cut off (for tutorial on that and what to do with the top click here) it is not suitable for making two bags. After cutting off the legs I measure the bottom. I'm going to be cutting open the legs so I multiply by two and then cut the legs again at that length. Ex. these pants are 9in. across the bottom so I cut at about 17in. Set aside the bottoms and take the top strips, you see why this is a good project for stout pants? Dividing the legs in two would make two very short wide totes, not so useful. 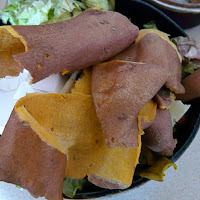 Cut open then fold over the strips, and use a straight-edge to make it rectangular, and cut in half the hot dog way. These strips needn't be perfect rectangles, but lot's of twist and turns will make a blobby bag. Cut the leg bottoms up the middle to make squarish pieces. Measure the sides and the edge that will be the bottom of the bag. 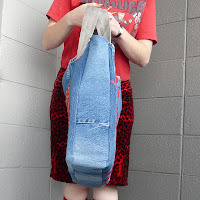 (I let the natural hem of the pants be the hem of the bag). Add up these sides, that's the total length of strips you will need, and give yourself some wiggle room, add a few more inches. 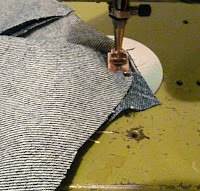 Sew the strips together and set aside. Take one of your large square leg pieces and decorate as you please. 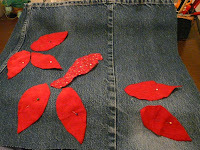 After appliquing your little heart out, grab the long strip. Fold over one edge and hem. Line up the top edge with an edge of the bag and start sewing. Be sure to backstitch of zig-zag to secure the top, as that part gets lots of stress. When you're at the far edge secure appropriately, it will look like this, with one end of the strip hanging over with extra. 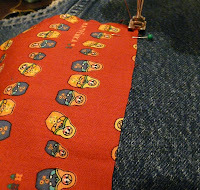 Prepare the other square by sewing on pockets. 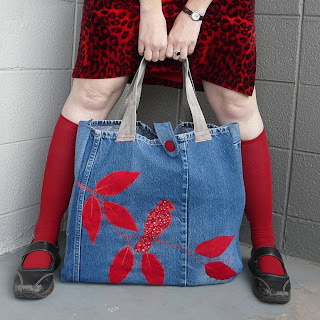 Yes, I suppose you could make a bag without pockets, but why? I like to make two pockets, one slightly smaller then the other. 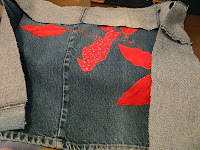 Then sew the inner pocket on first so that the outer pocket covers the stitches. 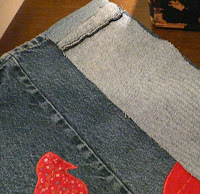 Sew the strip onto this square in the same manner as the first, starting with the hemmed edge. Check as you go to make sure the corners of the faces are in about the same spot on the strip. That is, make sure the two big pieces line up. When you get to the end you should have a little hang over, cut it to size and hem it up. Now just add handles! 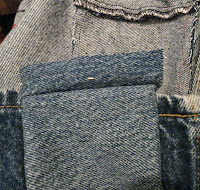 Sometimes there is enough extra pant to make handles from the denim, but I only had enough from these pants for a button strap to go across the top. These handles are seatbelt webbing, the pick-n-pull auto parts is a good cheap source for seatbelts. Pro-tip : Don't use your good sewing scissors on these, tin snips or heavy duty garden shears are a much better choice! Next put on a skirt, go out on your balcony in February weather and hope your goosebumps don't show. 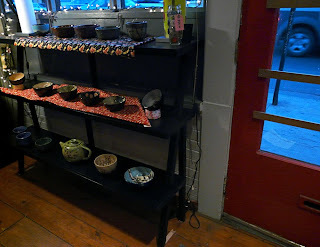 To see more pics of the finished product, check out the Etsy listing.